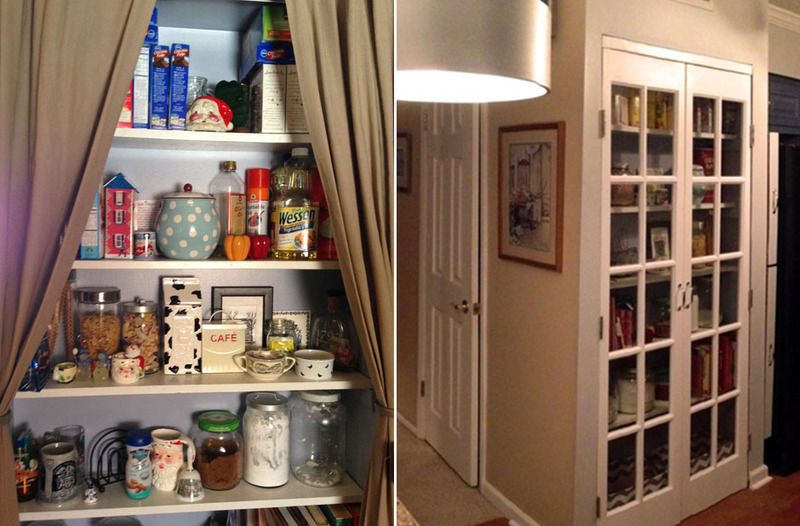 Simply stated, our pantry was an eyesore. It was a little nook of shelves with old curtains pulled to each side. We were going to put our house on the market soon, and in looking at the competition, we kept seeing very similar houses with beautiful kitchens. We looked at our old countertops, painted cabinets, and raggedy pantry….and sighed. 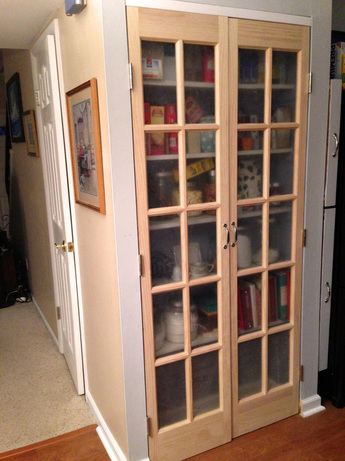 Then, I got an idea – installing double French doors on the pantry. I tend to be very particular when it comes to what I want. Installing any old French doors wasn’t going to cut it. French doors can be expensive but a 10% coupon code, which is pretty easy to find with Overstock, helped with the price. The before picture (below) is so zoomed that I thought I would include the below pictures too. These are unfortunately the best pictures I could find. 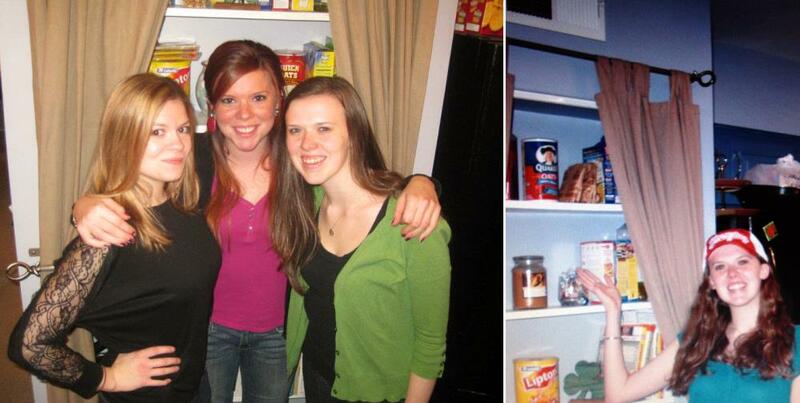 The first is a picture of two of my sisters and me, standing in front of the pantry. You can see the old curtains and the tiebacks. It was pretty awkward having the curtained pantry in the middle of our kitchen. The second is my sister PK, acting like Vanna White, and it shows the curtain rod and the pantry shelves. It needed an upgrade, didn’t it?! The doors I found were sold as bi-fold doors, but the conversion to French doors was simple, especially because we had an existing opening. This made for a much easier door installation. Also, the doors were cheaper to buy unfinished – which wasn’t a problem because I don’t mind painting. Amazon also has a lot of French Doors too if you are looking for more options. To install the double French doors in an existing opening, Ash removed the six small hinges that connected the door panels together. These hinges were light duty and were meant to be used in a bi-fold setup with little load. He purchased six heavy duty door hinges, figuring that due to the glass, 3 hinges per door would be needed to handle the weight. (Aside from that, no additional extra hardware was needed. The actual door came in several different sizes, so we bought the one that most closely fit the pantry opening. It wasn’t perfect because the door height was just a little short. So Ash filled the gap at the top with a piece of 2 x 4 wood painted white (as you can see in the picture). He also had to trim the baseboard at the bottom so that he could have a flush edge for the French doors. To mount the French doors, he installed the hinges on the doors first. Then he took one door panel and placed it in the ‘open’ position in the pantry, with the hinges open 90 degrees. He used some scrap wood (about ¼” thick) to elevate the door off of the floor. With the door in position, he used heavy duty screws to secure the hinges to the wall. He then removed the scrap wood supports on the floor and verified that the door swung open and closed easily. With the double French doors mounted, the next step was painting. 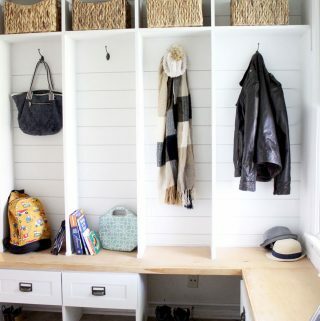 I chose a white semi-gloss paint to match the baseboard and chair rails that I just refreshed. It went on pretty easily with just one coat needed. There was no need to use any masking tape for the glass panels. This particular door came with a protective plastic film on each glass panel, so it was easy to paint the double doors without prep work. After screwing on the door handles, the last step of the door installation was to attach some magnetic catches at the top to keep the doors closed and to also serve as a stop to prevent the doors from swinging inwards. The magnets Ash used were way too strong, as they were making a loud, clanging noise as they connected. Also, when we opened the doors, the panels shuddered from the magnetic tension release, which wasn’t good for the glass. Ash simply replaced them with less powerful magnets that were just as effective. As you can see, this weekend project of installing French doors turned out great. Our raggedy old curtains were now beautiful double French doors. A simple swap made a drastic difference. Here’s another look at the before and after of installing the double French doors. 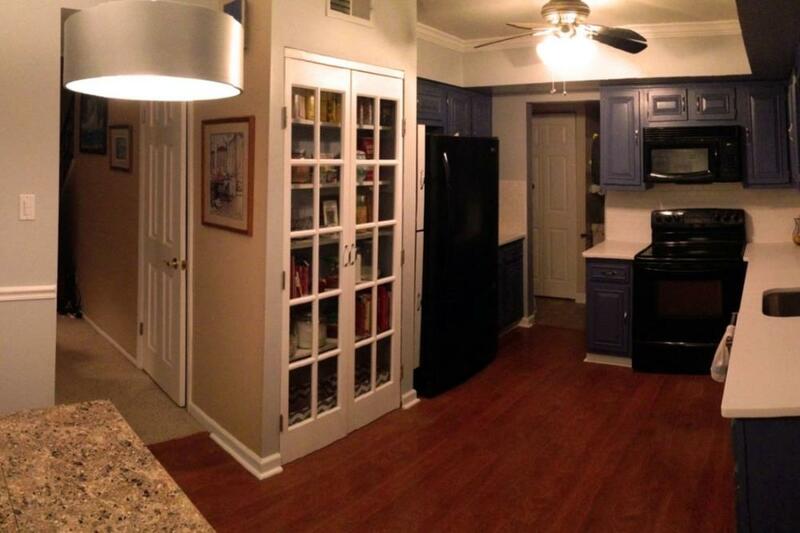 It really updated our kitchen without touching the countertops or cabinets. Now that we are in a new house, I miss those interior French doors; however, I have a plan to work them into our new house too! Super awesome pantry door!!! And I love the color of your kitchen cabinets. Thanks for sharing on the Pleasures of the NW’s DIY party. Wow! What a difference! They look great!! This looks fabulous!!!! And I LOVE the size of your pantry. Ours is TEENSY TINY!!! I had to use a hall closet for extra kitchen pantry items. Crazy. I’m adding this door idea to my “for my dream home” dreams!! That looks awesome! Great job! Gorgeous doors! Love the glass in them too. When we had our extra space closed in and added a pantry to the kitchen, I insisted on french-style doors for the pantry. It’s so much better than a bifold! Thanks for sharing at the #happynowlinkup! Looks terrific! We put the same type door (Glass panels) at the top of the stairs going down to the basement. It was such a wonderful decision and looked SO much better than a solid door. What a great transformation! Thanks for sharing with us at #OvertheMoon Link Up. I love the new French doors – so clean and classy. Thanks, Carol! Me too – this was one of my favorite upgrades! Thanks, Jess – will do! Great update! Thanks for sharing at Celebrate Your Story! Thanks, Alayna! 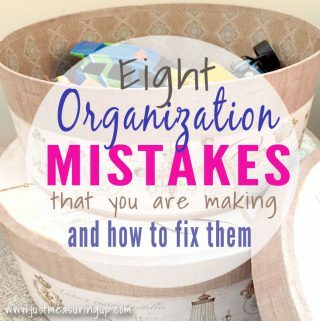 I know – I can’t believe we lived with that curtained pantry for as long as we did! Yes, taping off all of the glass would have been too much! We made sure we read the reviews carefully enough to know we didn’t have to! Loving the upgrade! I don’t think I would have ever thought to do that. 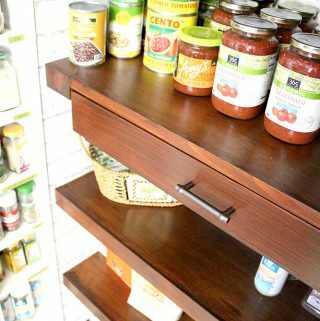 what a great new pantry! it looks like it was always there. This looks great! What a difference it made. Your hard work really paid off. 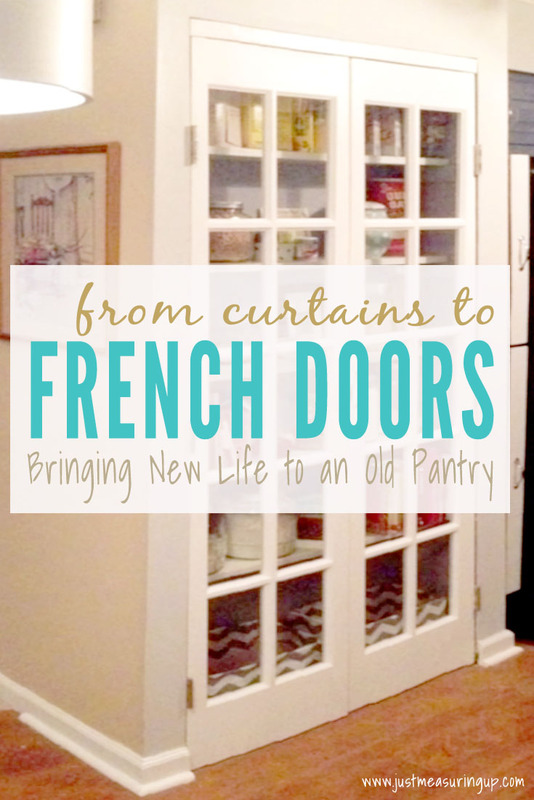 What a different those french doors make, it’s like your kitchen grew up 🙂 Thanks for sharing your inspiration with us at Waste Not Wednesday Link Party! Hahaha it did!! Thanks Toni! Your pantry doors look so beautiful. what a change! I love the farmhouse look, thank you so much for sharing at Sweet Inspiration, Happy Saturday! What a great upgrade. It looks fantastic. Wow, what a big difference the doors look great guys! Thanks for sharing your project at Fridays Furniture Fix! Thanks for coming to the Blogger’s Pit Stop last week with your post. Every project shown in your blog brings some good idea along with it. The French doors for the pantry worked perfectly. I am using the idea here at home and for that my sincere thank you. A dramatic improvement! For me, I would take it one step further and do a etching on the door glass….most of them frosted with nothing and then randomly add a fruit or words about food, normally I have no ideas about this, but since it came to me thought I would offer it up! This looks great. Such a lovely makeover. Thanks for sharing at Creative Mondays last week. Your post will be one of my features later. YAY!! Thank you so much:)) super excited! Lovely idea that help you sell the house, it is worth that investment surely.